Cyclamen, Cyclamen spp. Cyclamen is well-known as a decorative holiday plant, but it is a wonderful plant in the garden as well. Less than a foot tall, this charming mounded plant thrives in any well-drained soil. Native to Europe, the Middle east and Northern Africa, its natural habitat is woods, rocky places and alpine meadows. The hardiness of individual species varies, but is generally zones 5 to 9. Like Shooting Star (Dodecatheon), another member of the primrose family, the petals of cyclamen are reflexed. The flower is nodding while the petals point upward, giving it a somewhat inside-out appearance. Flower color ranges from white, pink, violet to red, some cultivars being bicolor. What Kinds of Plants Can Grow in the Shade? Depending on which of the 20 species you choose, it will bloom at various times of the year, usually either spring or fall. After the blossoms are pollinated by bees, the flower stalk coils protectively around the seed head and lowers it to the ground. Cyclamen's highly patterned leaves are as attractive as the flowers. They are usually dark green with white or silver. They are triangular or heart-shaped to rounded. Cyclamen grows from a corm, bulb-like underground stem. Plant in a sheltered location with well-drained soil. Cyclamen are very shade tolerant, doing well under tall shrubs or trees. They do fine with root competition from other plants. If they like their location, they are capable of slowly spreading by seed and corm to form colonies. Plants can be purchased at the nursery either as a dry corm or as a potted plant. It can take several seasons for a corm to grow into a good sized plant, while plants already in leaf become established much more quickly and can begin to spread. Plant the corm just below the soil level with the concave side up. In colder climates, plant four to six inches deep. Cyclamen can also be grown from seed. As soon as the seed is ripe and the capsule splits open, harvest the small brown seeds and plant them shallowly in a light seed starting mix. Germination takes four to six weeks at about 60 degrees. Once the first leaf has developed they can be transplanted into a tray of well-draining potting soil, spaced two inches apart. Place in a well-ventilated cold frame or cool greenhouse. When the plants go dormant, check the size of the corms. Plant in the garden when they are one half inch in diameter or larger. The most common problem encountered when growing cyclamen is rotting corms. This is caused by excess moisture around the roots, and can easily be avoided by choosing a planting site with good drainage and amending the planting hole with organic matter or grit. Top-dress the area with compost yearly. During the summer to early fall, most cyclamen go dormant. Hold off on watering during this period. Cyclamen favor slightly alkaline soil. There are few flowers as sweet for a woodland garden. Cyclamen will also do well in a partially shaded rock garden or alpine trough garden. Trough gardens are especially nice if cyclamen are not hardy in your zone, as they can be moved to a protected spot in winter. The hardiest species are Ivy-leaved cyclamen, Cyclamen hederifolium, C. purpurascens and Eastern cyclamen, C. coum. Choosing species that bloom very early or late will extend the seasonal interest of you garden. In temperate areas cyclamen leaves are attractive through the winter months. Ivy leaved cyclamen, C. hederifolium makes a good houseplant if given a cool location with bright, indirect light. Persian cyclamen, C. persicum, known as florist's cyclamen, has large flowers and can be made to re-bloom indoors if given a dormant period and proper care. It is hardy outdoors only in zones 10 and 11. Cyclamen is also known as sowbread because it was once used to feed pigs in southern Europe. However, cyclamen corms are poisonous to humans. Ivy-leaved cyclamen, Cyclamen hederifolium The numerous white or light pink flowers come up in autumn before the leaves. They can be scented strongly of lemon or lilies. Adaptable to a range of soils provided they drain readily, this species readily naturalizes. The corms can grow to four inches in diameter. Like other cyclamen, it resents being transplanted. In the wild it grows in forests from Italy to Turkey. Formerly called Cyclamen neapolitanum. Persian or Florist's cyclamen, Cyclamen persicumPopular as a house plant around the holiday season, the many hybrids of Persian cyclamen have large, brightly colored flowers which will last for several weeks if keep in a cool location out of direct sunlight. After blooming, taper off watering until the leaves turn yellow. Allow the plant to rest in a cool, dimly lit spot without letting the soil dry completely. When growth resumes, water regularly and feed with half-strength plant food. Subsequent flowerings may not be as showy as the first- the flowers will likely be smaller and less intensely colored. In zones 10 and 11, Persian cyclamen can be planted in the garden. In the wild it blooms from winter to spring in North Africa, Greece and Israel. This species is native to southern and eastern Europe. Pink to purplish flowers appear in late summer and autumn. The round-tipped leaves are plain dark green or veined and patterned with silver. Plant in a spot with excellent drainage. Hardy in zones 5 or 6 to 9. Cyclamen Atkinsi - A hybrid variety of the Coum section. The flowers are larger than in the type, varying in color from deep red to pure white, and are plentiful in winter. Round-leaved Cyclamen (Cyclamen coum) - This, like the others of the same section, is perfectly hardy, and frequently in bloom in the open ground before the Snowdrop; yet, to preserve the flowers from unfavourable weather, the plants will be better with slight protection, or a pit or frame in which to plant them out. Grown in this way during the early spring, from January to the middle of March, they are one sheet of bloom. When so cultivated, take out the soil, say one and a half to two feet deep, place at the bottom a layer of rough stones nine to 12 inches deep, and cover them with inverted turf to keep the soil from washing down and injuring the drainage. Then fill up with soil composed of about one-third of good free loam, one-third of well-decayed leaf-mould, and one-third of thoroughly decomposed cow manure. Plant one and a half to two inches deep. Each year, soon after the leaves die down, take off the surface as far as the tops of the tubers, and fresh surface them with the same compost, or in alternate years give them only a surface dressing of well-decayed leaves or cow manure. During summer, or at least after April, the glass should be removed, and they ought to be slightly shaded with Larch Fir boughs (cut before the leaves expand) laid over them, to shelter from the extreme heat of the sun. As soon as they begin to appear in the autumn, gradually take them off. 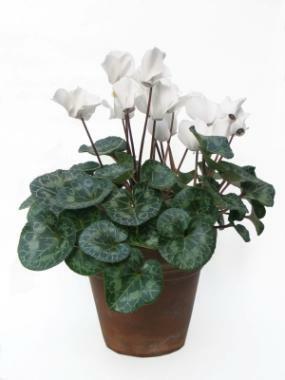 This cyclamen's distinctive feature is its broad, round tipped leaves. In some cultivars they are almost entirely silver, but can be marbled or figured with dark green. The petals are rounder and shorter than other species. Colors vary from white to deep pink, but most have a darker spot at the base. It flowers in winter or early spring. It is hardy in zone 4 and 5 if given a sheltered location in partial shade and mulched in winter. In zones 6 through 9 it is evergreen and should be planted in shade. In the wild it is found from eastern Europe to Israel. A similar species is Cyclamen vernum, formerly known as C. ibericum, and C. atkinsii. Cyclamen Cyprium - This well-defined species has rather small heart-shaped leaves of dark green, marbled on the upper surface with bluish-grey and of a deep purple beneath. The flowers which are pure white, tinted with soft lilac (the restricted mouth being spotted with carmine-purple), are well elevated above the foliage. It is one of the most chaste and beautiful of the hardy kinds. S. Europe. It is found on shaded rocks in mountainous districts. European Cyclamen (Cyclamen Europaeum) - The leaves of this species appear before and with the flowers, and remain during the greater part of the year. Flowers from August to November, or, with slight protection, until the end of the year. The flowers are a reddish purple. C. europaeum thrives freely in various parts of the country in light, loamy, well-drained soil, as a choice border and rock-garden plant. Where it does badly in ordinary soil it should be tried in a deep bed of light loam, mingled with pieces of broken stone. It luxuriates on old walls and on the mountain side, with little earth to grow in. Ivy-leaved Cyclamen (Cyclamen Hederaefolium) - Tubers are frequently one foot in diameter, and covered with a brownish rough rind, which cracks irregularly so as to form little scales. The root-fibres emerge from the whole of the upper surface of the tuber, but principally from the rim; few or none issue from the lower surface. The leaves and flowers generally spring direct from the tuber without any stem (there is sometimes, however, a small stem, especially if the tuber be planted deep); at first they spread horizontally, but ultimately become erect. The leaves are variously marked; the greater portion appear after the flowers, and continue in great beauty the whole winter and early spring, when, if well grown, they are one of the greatest ornaments of borders and rock gardens. Often these leaves are six inches long, five and a half inches in diameter, with 100 to 150 springing from one tuber. This species has been naturalised on the mossy floor of a thin wood, on very sandy, poor soil, and may be naturalised almost everywhere. It would be peculiarly attractive in a semi-wild state in pleasure grounds and by wood walks. Iberian Cyclamen (Cyclamen Ibericum) - There is some obscurity respecting the authority for the species and its native country. The leaves are very various. It flowers in spring, the flowers varying from deep red-purple to rose, lilac, and white, with intensely dark mouth. Spring Cyclamen (Cyclamen Vernum) - The leaves rise before the flowers in spring; they are generally more or less white on the upper surface, and are often purplish beneath. Though one of the most interesting species, and perfectly hardy, it is seldom cultivated successfully in the open border or rock garden; it is impatient of excessive wet about the tubers, and likes a light soil, in a rather shady nook sheltered from winds, its fleshy leaves being soon injured. The tubers should be planted deep; say not less than two to two and a half inches below the surface.